In Japan making a garden is considered a high art. Careful thought and consideration is given to the placing of each element in order to create a harmonious space. Japanese gardens almost always have water, even the dry gardens use gravel to mimic water, often raked into a pattern to represent ripples and currents. In this garden water cascades through rocks into a newly landscaped large pool. Alongside the pool a seating area has been sunken into the ground so when you sit at the table you’re closer to the water and the with water plants at eye level. Beyond the pond there’s more large rocks lining a border, this time with plants cascading over, pink persicaria putting up spears and broad hosta leaves softening the hard landscaping. 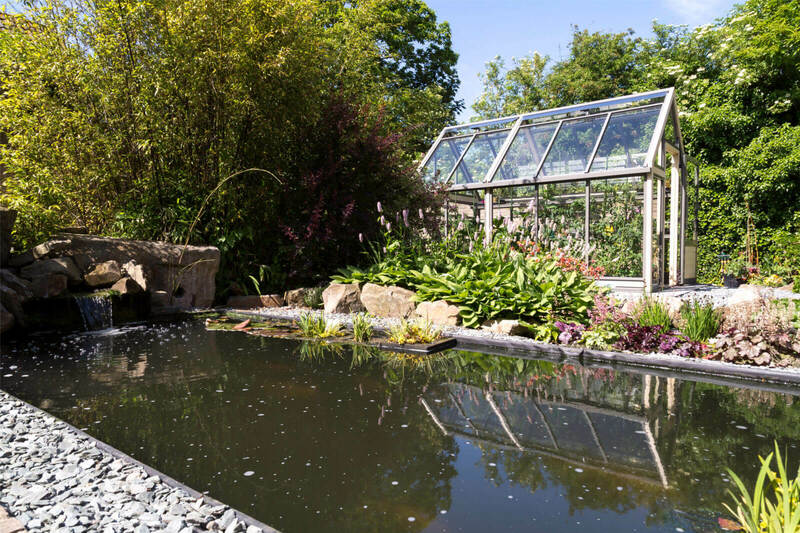 A smaller pond with water lilies is nestled in this border visible as you approach the greenhouse. Use of miniature trees and bushes creates the illusion that they are far away making the garden look larger than it actually is. A similar trick is used by placing large rocks in the foreground and similar shaped but smaller rocks in the background. In this garden it’s clear that wildlife plays an important role. It’s not just the incorporation of water but a line of hives adds movement and life to the garden, a constant stream of busy bees. The ponds will attract frogs which in turn will help keep pests like slugs at bay. Perhaps this is why the hostas look so healthy. Practically the use of large angular grey gravel compacts easily making it easy to walk along on the well trodden path to the greenhouse. The grey contrasts with the larger sandstone rocks in the same way that water might. As you’d expect grasses and bamboo feature around the garden. A mature black bamboo, Phyllostachys nigra, provides a little shade to the pond and rustles gently in the wind. In combination with the sound of water the calming effect is immediate as soon as you enter the garden. The greenhouse itself is laid on a level concrete footing. This has been made larger than the greenhouse and the effect of this is to create a frame, rather like a picture, around the structure amongst the gravel beds. This is an eight foot wide greenhouse by almost thirteen foot long, a good size for any budding gardener. The aluminium panels hold full length glass panes going all the way to the ground to ensure plenty of light. The Accoya, like all woods will silver down in the sun over the years to a silvery grey. 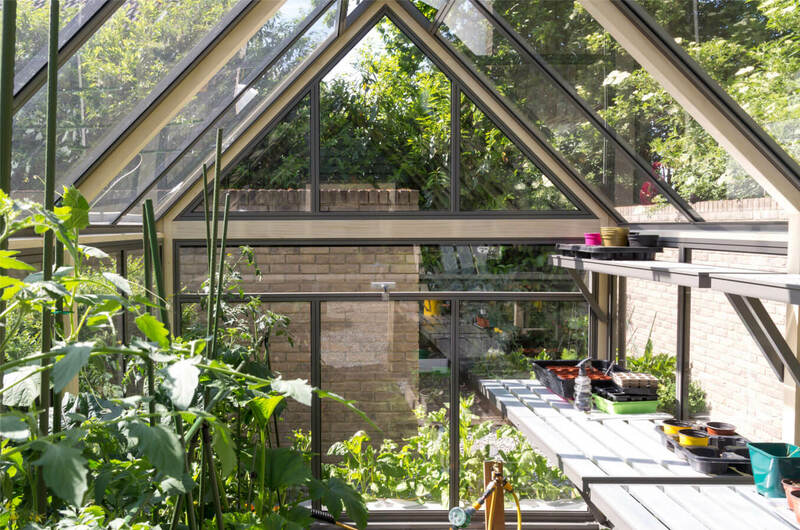 At the plain end of the greenhouse an optional full width vent can be opened along with the door to provide a good draft through the greenhouse on the hot summer days. One side of the greenhouse is used for growing from the ground whilst the other side has a compete length of staging and shelving. The staging useful for potting up and the shelf being closer to the roof providing a useful storage space for germinating seeds in pots or seed trays. 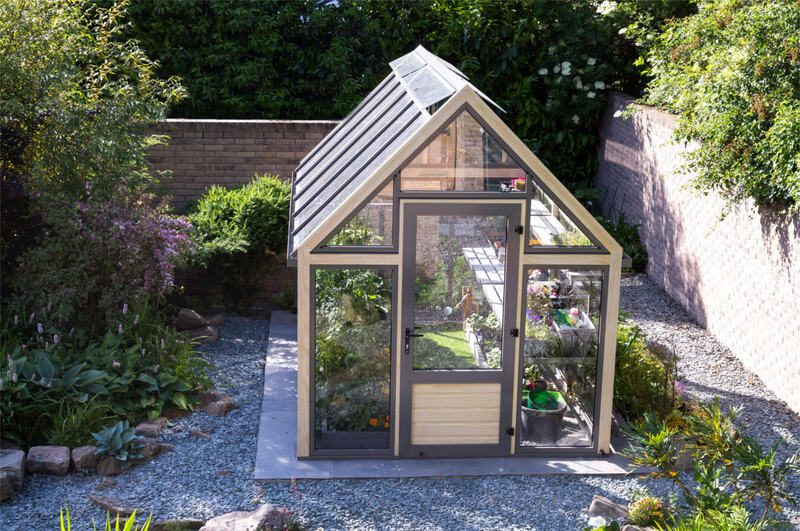 The door on the greenhouse can be hinged on either side and in this instance the customer has opted to have the lower door panel complete with Accoya boarding, a practical consideration perhaps to avoid it breaking the chance of any breakages if hit with a wheel barrow say. Like all our greenhouses the structure comes with full length frameless glass roof vents which allow plenty of light as well as ventilation. This is clearly a space for someone that likes to spend time in the garden. There’s a place to sit and relax, a place to eat, and with the greenhouse there’s a place to nurture tender plants. 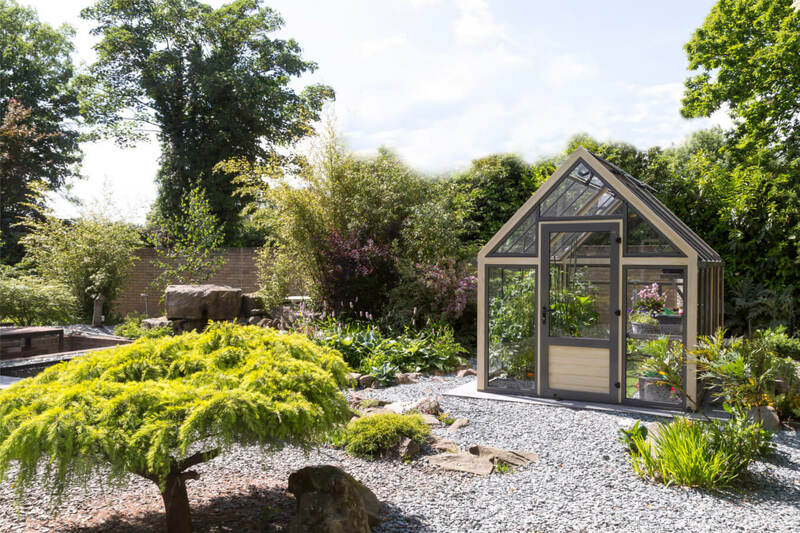 And of course, when it rains, which is not uncommon in Britain or Japan, there’s now a place to continue gardening under the protection of glass.